In late October, 27 education leaders from the Avney Rosha Institute took a management training course at Project Wadi Attir, where they learned to incorporate The Lab’s sustainability framework into school curricula throughout the country. The Avni Rosha Institute is an organization that seeks to advance the education system throughout Israel by engaging with school leadership. The 27 attendees, consisting of principals and vice-principals, hailed from different communities and regions. All were able to benefit from the unique pedagogical approach at Project Wadi Attir. Educational staff lead by Amran Amarni, the Director of Educational Services, taught The Lab’s sustainability framework and five core principles to the attendees. This framework underlies all of the work done at Project Wadi Attir, and it forms the basis for the curriculum at the project’s Agricultural School. This exposure will serve to strengthen the link between the Agricultural School and schools throughout Israel, and it will also further provide students with the tools to catalyze sustainability related changes in the world. The event concluded with an interactive project, in which the attendees created a decorative hand. They wrote the name of each domain on the fingers, and in the center of the hand they placed balls made from seeds and soil. 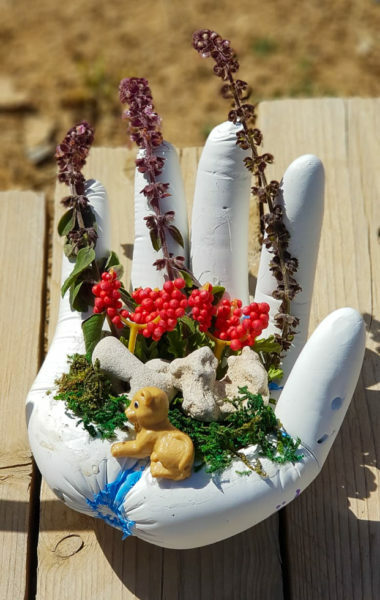 These unique sculptures serve as beautiful centerpieces for an educator’s desk, and also act as a reminder of the five domains and the importance of increasing awareness of these principles.